PhoneSat 1.0 during high-altitude balloon test. Photo courtesy of NASA Ames Research Center, 2011. While most of the recent media attention on NASA has understandably focused on the Curiosity rover on Mars, that’s not the only experiment that the space and aeronautics research agency has in the works. A team at NASA’s Ames Research center in Moffett Field, California, is working on the future launch of miniature satellites constructed with Android-powered Nexus One smartphones at the helm. Dubbed “PhoneSat,” this project is part of a larger experiment called the Small Spacecraft Technology Program that incorporates small consumer electronics into working nanosatellites. The PhoneSat launch has no firm date, but three PhoneSat units will be rocket-bound sometime in late 2012. (Hopefully, we’ll start seeing Tweets from PhoneSat’s currently quiet Twitter account.) However, there’s much to be excited about with the launch fast approaching. Here’s what we know so far. 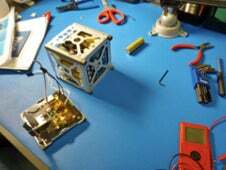 According to information provided by NASA’s Space Technology Program, the team has built two nanosatellite prototype models, which were originally going to be launched at different times. The first model, PhoneSat 1.0, has minimal functionality—the team wants to see if a mini-satellite with a smartphone can survive a short stint in space. A major gauge of success will be whether the satellite can send back operational health and picture data while in space. Besides a Nexus One, the main pieces of the satellite will include external batteries and an external radio beacon. A watchdog circuit will monitor the system and reboot the Nexus if necessary. Assembly of PhoneSat 1.0. Photo courtesy of NASA Ames Research Center, 2011. All of this will be packaged in a 10-by-10-by-10-cm CubeSat shell—not much bigger than a coffee cup—and three of these units will be manufactured. Each unit clocks in at an impressively low 4 pounds. And what chariot will carry this mini-sat? An Antares rocket, a low-Earth-orbiting rocket that can carry up to 15,000 pounds. A more advanced model, the PhoneSat 2.0, will improve on the capabilities of PhoneSat 1.0 by using a newer Samsung Nexus S; the satellite’s design will also include a two-way S-band radio, solar arrays, and a GPS receiver. The radio will command the satellite from the ground, while the solar panels will enable the unit to embark on a mission with a long duration. Also built into the PhoneSat 2.0 design are magnetorquer coils (electromagnets that interact with Earth’s magnetic field) and reaction wheels to control the unit’s orientation in space. According to a NASA public relations representative, two PhoneSat 1.0 models and one PhoneSat 2.0 are scheduled to launch aboard the maiden flight of Orbital Sciences Corporation’s Antares rocket later this year. The PhoneSat team has been preparing for this mission for a few years now by running tests to push the Nexus One’s limits. In July 2010, two Nexus Ones were launched on rockets as a preliminary test of how the phones will handle high speeds and high altitude. One rocket crashed and destroyed the smartphone; the other landed with the Nexus One perfectly intact. 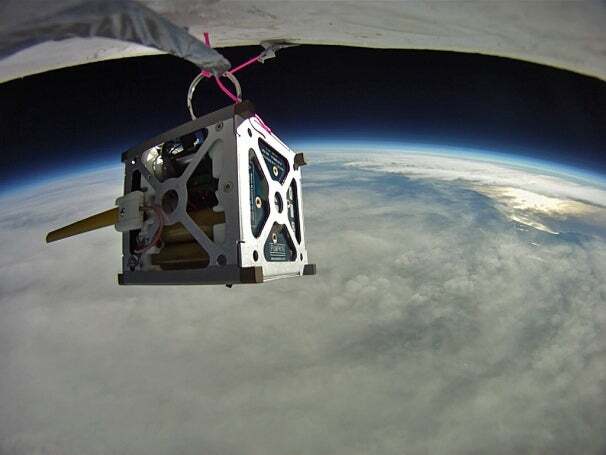 PhoneSat 1.0 has also been tested in a thermal-vacuum chamber, on vibration and shock tables, and on high-altitude balloons, all with great success. The philosophy behind these launches is quite similar to the Silicon Valley entrepreneurial mindset—to “launch the lowest-cost and easiest to build satellites ever flown in space,” as stated in a PhoneSat flight demonstration document. Each PhoneSat prototype costs about $3500 to build, and the NASA engineers use commercial off-the-shelf hardware in their designs, none of which have been modified. The engineers have not created any new technologies for this mission—they’re working entirely with widely available products. Not only do these low-cost units show off how run-of-the-mill consumer devices can be used in larger space exploration experiments, they also will decrease development costs for future NASA small-spacecraft projects. The team plans to use the PhoneSats in future missions involving moon exploration, low-cost Earth observations, and testing of new technologies and components for space flight. Another mission scheduled for 2013 plans to use the PhoneSat 2.0 to conduct heliophysics measurements.